ha. mine is chewed until thoroughly dead of any flavor but if my wife caught me putting it under the desk…yikes. fun one shot! cute! Although, gum under desks is so gross! Fun poem you wrote here. Gum as muse, I love that. Indeed, gum has a secret life. Agree under desk gum is gross. Like the descriptions in your poem. Nice One Shot! Thanks Adam. As always, it’s a pleasure to join your One Shot Wednesday. I just remembered I forgot to add a link to it. Woops. So wonderfully fun! An ode to gum. I bet you’ve seen a few gum globs under desks, too! 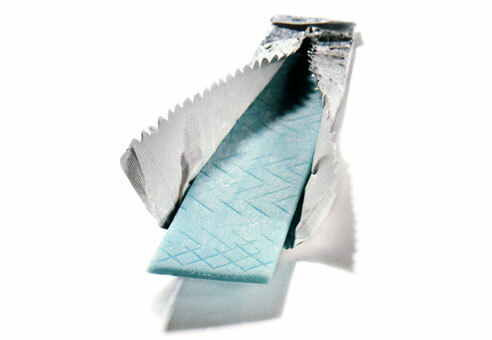 An ode to chewing gum, unlike any other I’ve read. Thanks for the fun! Glad you enjoyed it Maureen. Sometimes writing something serious about something very silly helps me to break into a new style or area of writing. And after the last few days of sadness, that ended with a happy ending, the gum seemed an appropriate way to celebrate and expand. Thanks for your comment! This is so clever. I’m thinking this we would be such a great prompt. While searching for a gum image, I found all kinds of gum art (Yuck) though truly amazing what people are doing with it these days. One was a sculpture (made of chewed gum) of a large bear, licking a wall that had a piece of gum stuck to it. I don’t chew gum, but I loved all the images you created here. I love that even the simple act of chewing gum can become poetry! And reading that people create images with ABC gum – YUCK! how you manage to take something so ordinary and write something so cool…will never chew a chewing gum again between semi conscious teeth without thinking of this..
Good. It’s about time the crushed creatures of this world are remembered! 🙂 Thanks so much for your lovely comments. Nice One Shot! Maybe I need to chew more gum when I write; my pen tops will thank me. That made me laugh. Next poem challenge: Pen Tops. What happens to them? Ironic! I read your post on the day that I had gum for the first time in probably a year! How cool is that. Mine was an Orbitz raspberry lemon mist though, not wintergreen. Delicious. A confession! That’s the first brave soul. Anybody else out there? Well Done, Alex. What a sweet memory – a silver fan from Mommy’s hands; so glad you enjoyed it and shared the memory. Thank you!! LOVE IT! i felt like i was actually chewing wringley gum as i read the poem and then I started to think about all the things in the world which are used for our pleasure (radio, tV, walkman, mobile phone in some cases) and then thrown away or in this case stuck on your desk. The picture is Fantastic too. Great stuff – I love to hear when another writer/artist is inspired to think in new dimensions. My partner is just getting ready to ditch his old turntable recordplayer, amp and speakers (from the 1970’s) because all his music is now on his Ipod. I wonder how they, with so much ability to play music still within them, feel, knowing they’ll soon be taken to the ECO waste shop and pulled apart into tiny bits, melted down and recycled. Will the music still be in them? Will the Beatles’s energy and Judy Collins’ voice hover in their molecules, or will they lose all memory of ever having made such wonderful sounds? Like the spent gum hiding under the desk, stuck in unfortunate limbo, they die, wilt and fall apart in unglorious, unsung anonymity. Thanks so much for your lovely comments! Thanks Nick, glad you enjoyed the mind-bending, jaw crunching perspective of this writer’s gum! love the playfulness throughout in this, finding me thinking am i reading too much sensuousness into this gum? as ever you keep focus on the central point and everything serves to the purpose, soe fine lines too. Very well done, you have talent to take ordinary things out of the life and make it move up in the scale of visibility… You have that Child like curiosity and the eye… Keep it undiluted as you go further…Enjoyed it. Thank you shadow dancing for your kind comments. I look forward to visiting your blog. Enjoyed reading this.. wonderful observation..
It’s cool, like the gum. Glad you enjoyed it, alakaline! Your gum inspires words? I’ve got to get another brand.